Bi-filament tape is expensive and a little extra care when handling it will insure that you don’t waste a single inch. 1. Never let the tape contact itself sticky side to sticky side. 2. 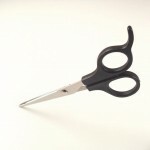 Cut with very sharp scissors. While you can certainly cut bi-filament tape with a knife, even a very sharp blade creates an irregular edge which will make the tape less likely to properly bond at the edges. 3. Don’t stretch the tape when applying. Even though though bi-filament tape is designed fro minimum elongation, if it is stretched it will try to return to its original length, reducing its bonding ability. 4. Store the tape out of direct sunlight. This product has no UV (ultra violet light) protection and will break down and lose its adhesion after long term exposure to sunlight. 5. Rotate rolls that are stored for long periods of time. Over long periods of time, tape stored on its edge will show signs of the adhesive migrating to the bottom side of the roll. Periodically turning rolls of tape over will reverse this process. 6. Store multiple rolls with silicone coated paper between them. Bi-filament tape ships with specially coated paper sheets between the rolls. This prevents the tape from bonding roll-to-roll when stored vertically, one roll on top of another.